When the weather gets nice, I love to have fresh herbs on hand for cooking. Sometimes during the cold months, when I want to pretend that I have my own cooking show on the Food Network, I will buy a live basil plant and put it on the kitchen counter next to the sink.The smell is amazing and it convinces myself and others that I’m a better cook than I am. Bonus. I have also had some success planting herbs in pots in the sunny window of my laundry room. 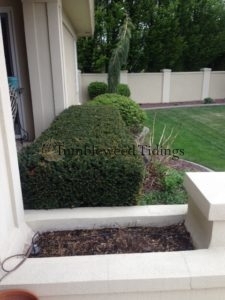 But most of the time here in tumbleweed land, we have to wait for summer and plant herbs outdoors. 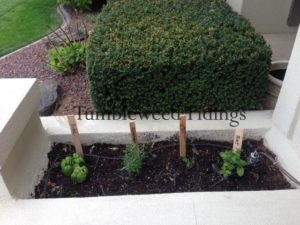 My favorite herbs are sweet basil, rosemary, dill, parsley and spearmint. Ah, basil. I mean, is there anything other than chocolate, pizza or lavender baby wash that smells as good as sweet basil? 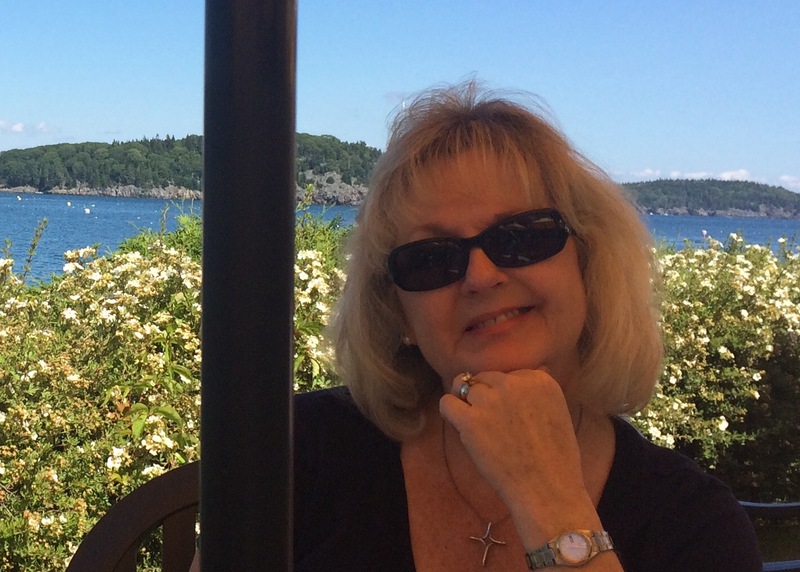 I love dill on most seafood, rosemary on pork or poultry, parsley to freshen up almost anything, and mint to put in iced tea, water, lemonade or….. (shhh), the occasional Mojito. For the past several years, we kept our herb garden out at the back of our yard, near the garden. This seemed like a logical location, but when I am frantically slicing, dicing, and sautéing like a contestant on Iron Chef, the last thing I want to do is run to the back of the yard to cut herbs. I could plan ahead better, but well, you know. So last year, I looked at the two planter boxes that flank our stairway to the pool area and thought that instead of filling them with the normal flower assortment, why not make them my herb garden?! I’m slightly embarrassed that it took me eight years to figure this out. But wow, once I got it right, there was no turning back. They were handy, and therefore I used them all summer long. 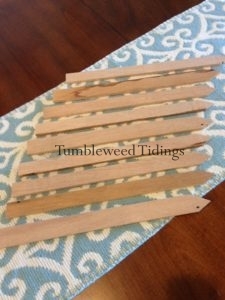 Recently, I asked my husband if he could make me some herb stakes out of paint sticks or scraps of wood. Before I could say please, he was in the garage and in about 10 minutes returned with these beauties. When I saw how nice they were, I asked him what the wood was. 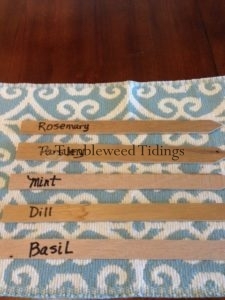 He nonchalantly said “Mahogany”……like everyone uses furniture grade wood for their herb stakes. I guess my herb garden is going designer this year! Some years I have started my herbs from seed, but after the long winter and cold spring we had, I purchased plants this year. 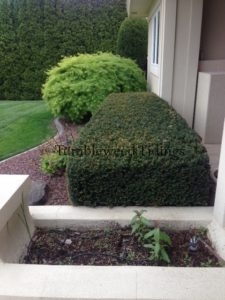 So it’s not like I really need herb stakes to tell full grown herbs apart, but somehow they elevate the herb garden to a new professional level. 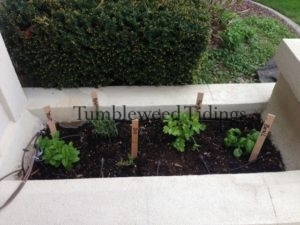 Here are the herb garden beds before……..
All they need now is some sun and warmer temperatures, and I think we will be seeing some wonderful meals with fresh herbs in our future. 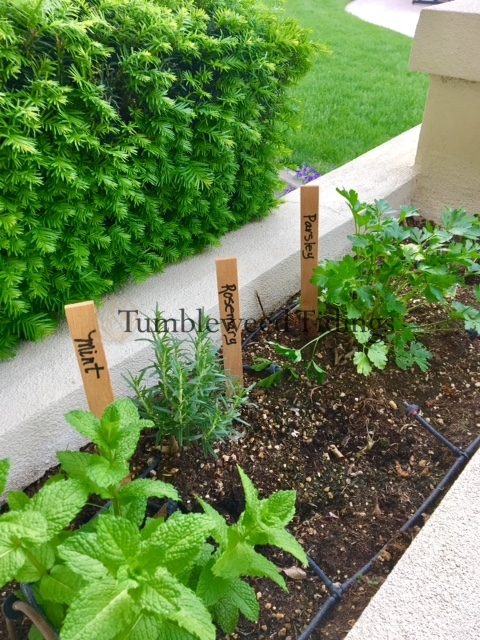 A note: Although I just happened to have these planter boxes available, patio herb gardens can just as easily be planted in pots or flower beds near the kitchen to enjoy. This is fabulous writing. I so enjoyed it.